The last few nights I have dreamed that I was walking long distances outdoors; I guess the Camino is still rooted in my subconscious and in my body, which has been conditioned to keep moving. With no more yellow arrows to follow, will I take up sleepwalking?! Since it’s Thanksgiving, here are some appreciations, from A to Z.
Albergues: Whether they were state of the art, with touch screen stoves and leg massage machines, or, in one case, a boxy shipping container filled with bunk beds, I always had a place to sleep. 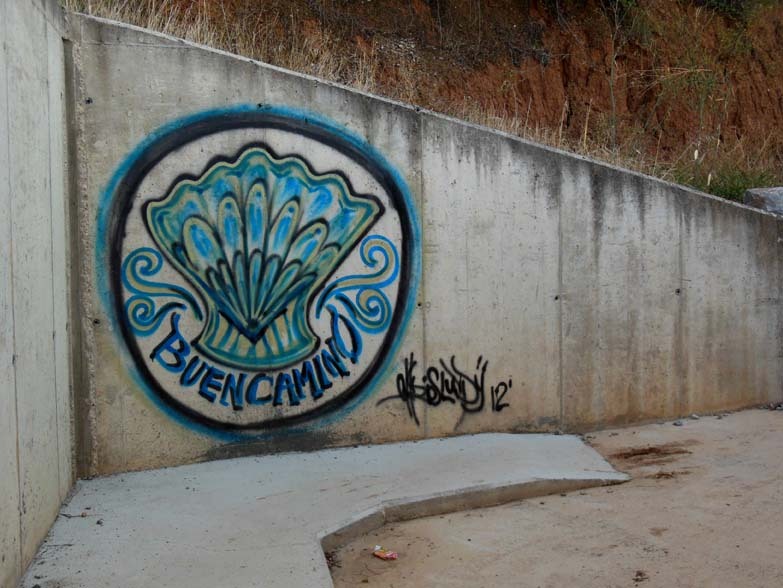 Buen Camino: The encouraging greeting offered by strangers and Pilgrims alike. Credencial: My Pilgrim “passport”, stamped with colorful seals of the places I visited and stayed. Desayuno: I got hooked on my Spanish breakfast of a (decaf) cafe con leche with a napoletana. Emulgel: The magic muscle relaxant, produced by Novartis, that many of us massaged into our legs. Gazpacho: sold in cartons, in supermarkets and vending machines, some of the best I’ve ever had. Hospitaleros: The managers and hosts at the albergues who, for the most part, helped ease the journey. Internet: It was there when I needed it, with pay-by-the-hour computers. And I was glad to discover that, after a few weeks, I didn’t really miss it. John Brierley: Author of my guidebook whose spiritual reflections helped me reconsider some of my more challenging experiences. Kelty: Manufacturer of my backpack, now going on ten years. Lights: Most albergues, restaurants and bars had either motion sensor or timed lights in the restrooms. While I admire Spain’s determination to consume less energy, I did have to remember to wave my arms around so I wouldn’t be left sitting in the dark. Music by Minna Bromberg helped drown out the snoring at night. Napoletana: Spanish equivalent of a chocolate croissant. Octopus: Pulpo in Spanish. As tasty as it is ugly. Peregrinos: The other Pilgrims who, whether they knew it or not, helped me see myself more clearly simply by showing up. Queso: Cheese, whether cow, sheep or goat or, as in common in Spain, all three mixed together. Delicious weight I was willing to carry. Rainbows: They appeared when I needed to see one, including gasp-inducing double rainbows that arced across the sky (much like in Colorado). Siesta: In Spain, it is perfectly normal, if not encouraged, to take a nap after walking. Rest is an integral part of any intense physical endeavor. Trekking Poles: They kept me upright and moving on many days. Vending Machines: They sold everything, from delicious, customized hot drinks, to bandages and blister care products. Weather: I was quite lucky: three mountain crossings with either full or partial visibility, only a few days of intense rain. I was prepared for the worst but, fortunately, was spared. X: a letter omnipresent in Gallego, the language of Galicia. Some of their words even begin with “X”, which is probably a boon to any Galician scrabble players. Y: I’m still not sure of all the deeper reasons why I went on the Camino, but maybe I don’t need to know that now. Zumo: Fresh juice, usually orange, always ambrosia. Beautifully thoughtful post! Love the creative way of saying thanks.